I’ve seen all eight of the nominees for the Best Picture Academy Award and if I was voting, I’d vote for Selma. I was reminded of this young man when I watched Selma. The civil rights activists portrayed in the film were courageous and, viewed from an era 50 years later when most Americans seem resigned to be bullied around economically and otherwise by the powers that be, inspirational. Throw in the refreshing portrayal of King as a human being with convictions and doubts and clever strategizing instead of a two-dimensional cardboard icon, and the superb acting of David Oyelowo, and you end up with a film that I wish more Americans would see. The film does misportray Lyndon Johnson. However, this relatively minor historical inaccuracy is nothing compared to the distortions and inaccuracies of American Sniper or, for that matter, The Imitation Game. DuVernay has stated that she wanted to avoid making a “White Savior” film. To understand why she might so desire, it’s worth taking note of what I call Ed Zwick Syndrome. Ed Zwick is a successful Hollywood director who made a trilogy of films that portray white people helping non-white people defend themselves from oppression because apparently they can’t do it on their own. First came Glory, in which a white Union officer in the Civil War makes good soldiers out of a regiment of blacks…and leads them to their death. At least Glory was inspired by a true story. Several years later Zwick made The Last Samurai with Tom Cruise as a mercenary captured by samurai rebelling against the government. He learns from their leader and uses his own warrior skills to help them with their revolt. But after the final losing battle, guess who survives while the others are killed? Yes, it’s Tom Cruise. Finally, Zwick made Blood Diamond with Leonardo DiCaprio as a soldier of fortune during a civil war in Sierra Leone who offers to help a black African farmer find his missing wife and children in exchange for access to a hidden 100-karat diamond. Zwick seems to have gotten over his White Savior period, but no sooner had he done so than along came Quentin Tarantino to make Inglourious Basterds and Django Unchained. I’m Jewish and I considered Inglourious Basterds to be anti-Semitic because it brings in a white American Christian to lead the oppressed Jews in their attempts to kill Nazis. In real life, there were plenty of Jews who fought the Nazis without any help from American Christians. If you don’t believe me, for starters track down Jewish Resistance In Nazi-Occupied Eastern Europe by Reuben Ainsztein. It’s a 900-page book…and that’s only Eastern Europe. There were revolts in the death camps and ghetto uprisings, and many Jews joined the anti-Nazi partisans (including my relatives Lusik and Hannah Valachinski). They didn’t need an American from Tennessee to lead them. Django Unchained? Another example of a white man teaching a black man to stand up for himself and kill people. Given this background, is it really any wonder that Ava DuVernay wanted to avoid making anything that resembled a “White Savior” movie? And, of course, in recent years Americans, like the white heroes of Glory and The Last Samurai, have led a lot of non-whites to their deaths in Iraq, Afghanistan and elsewhere. I beg to disagree. Any film that does not question the rationale behind the war it portrays by default accepts the correctness of that war. At best, what American Sniper shows is that whatever sincere patriotic motives to defend the homeland inspire a soldier to join a war, once he’s in the middle of that war, his whole focus is on defending his fellow soldiers instead. Let’s look at the historical accuracy of the portrayal of Kyle as a human being. Kyle claimed that he punched former Minnesota governor (and Navy SEAL) Jesse Ventura in a bar because Ventura said he hated America and that the SEALs “deserve to lose a few.” Ventura sued Kyle. Kyle died before the case went to trial, but when it did, the jury ruled in favor of Ventura and awarded him $1.8 million in damages for defamation. Kyle also claimed that after Hurricane Katrina, he travelled to New Orleans, installed himself on the roof of the Superdome and shot to death about thirty people he said were looters. There is zero evidence to support this story. Likewise, his claim that he shot to death two carjackers who tried to steal his truck is a fabrication. In other words, Chris Kyle was not someone whose word you could trust, and the details related in his autobiography are not necessarily historically accurate. But even Kyle’s dubious version of reality was too much for Clint Eastwood and screenwriter Jason Hall. Kyle said that the first person he killed in Iraq was a woman carrying a bomb. Just to make sure viewers perceive Iraqis as truly venal, Eastwood and Hall added a fictional detail: the woman hands the bomb to a child who is advancing on U.S. troops until Kyle kills him. In the movie, Kyle’s arch enemy is a sniper who is identified as a shooter who represented Syria in the Olympics. In one scene there is even a framed photo of the alleged Syrian sniper standing atop a medal podium that looks a lot like the Olympics. I am the president of the International Society of Olympic Historians (ISOH) and I knew this was a ridiculous fiction. 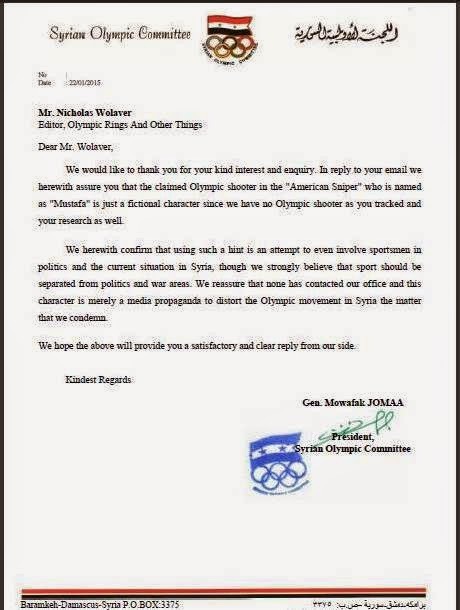 ISOH member Nicolas Wolaver took the time to fact-check this detail here and here and even received a letter from the president of the Syrian Olympic Committee confirming that there was no such person. In real life, Chris Kyle considered all Iraqi males to be his enemies and referred to them as “savages.” He bragged about looting their homes and got a kick out of driving at everyday Iraqis just to see them scream and run. “On the front of my arm, I had a crusader cross inked in,” he wrote. “I wanted everyone to know I was a Christian.” I wonder if this “Christian” ever bothered to read Jesus’ words. As for American Sniper’s portrayal of the Iraq War, don’t even get me started. The fact that the film had to be pulled from theaters in Baghdad because Iraqis, particularly those who had fought alongside Americans, were outraged, should say enough. There is a tendency to forget that a lot of people who go to movies are young or, to borrow a phrase from the world of electoral politics, “low information” Americans. For example, a recent poll showed that a majority of Republicans think that U.S. troops found a weapons of mass destruction program in Iraq even though President George W. Bush himself admitted that they didn’t. From what I’ve read, some people came out of the theater after watching American Sniper hating all Iraqis and Muslims and wanting to do them harm. They bought the movie’s premise that all Iraqis were the enemy, evidently forgetting that our troops were supposed to be supporting some Iraqis against other Iraqis. Actually, I think that one of the most realistic portrayals this year was in an entirely fictional Oscar nominee: Nightcrawler, in which Jake Gyllenhaal plays a creepy petty criminal who stumbles onto a lucrative profession: providing instant video of crime scenes to a local TV station. The producer he deals with, played by Rene Russo, has a narrative that underlies her coverage: urban crime is spreading to the suburbs and everyone should be afraid. At one point, one of her associates rushes in with breaking news: the home invasion mass murder they have been highlighting was really a drug cartel hit job and the victims were not some innocent family. Russo gives him a withering look…and they go on air with the home invasion of innocents angle instead.